Meet Jessica Roux. Jessica is one of the exhibiting artists in the Animystics Exhibition. She is a Brooklyn based-illustrator and designer, originally from North Carolina. 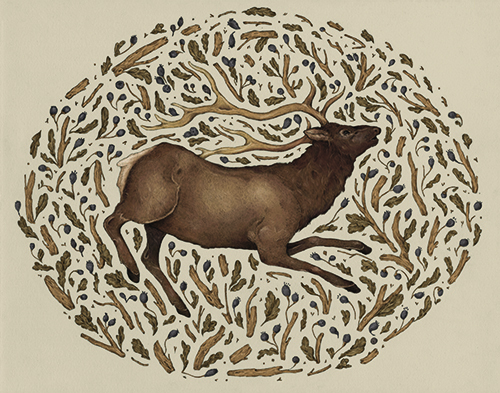 Jessica grew up surrounded by nature, and you can see the animal and nature influence in her work- she uses subdued colors and rhythmic shapes, rendering flora and fauna with intricate detail! "The elk comes to you when you are weak. It surrounds you with healing light, and passes its strength onto you." 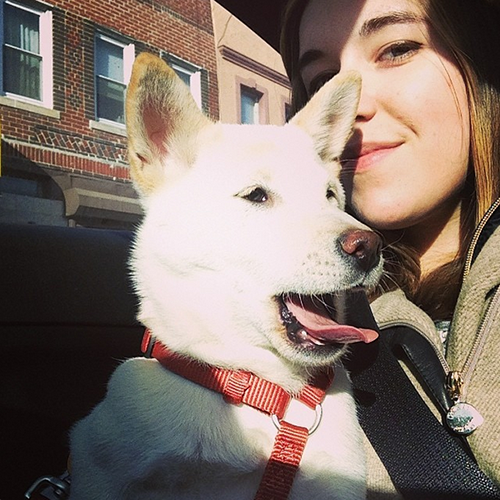 "I just became the mother to one AMAZING shiba inu, Molly. My fiance Nick and I had been looking for awhile for the perfect dog to expand our little family, and we stumbled across Molly while adventuring in the Village. She is the most amazing pet I've ever owned. Skillfully smart, calm and kind, she lifts my spirits every day."